Joe, his wife Mel and their 5-year-old son William have a perfect life. They are happy in their jobs and school and they make a perfect little family. Or do they? Joe believes all is well with his life until he sees his wife at a table in a hotel restaurant arguing with Ben, the husband of one of Mel's college friends. She doesn't see Joe and when he asks her about it, she lies. 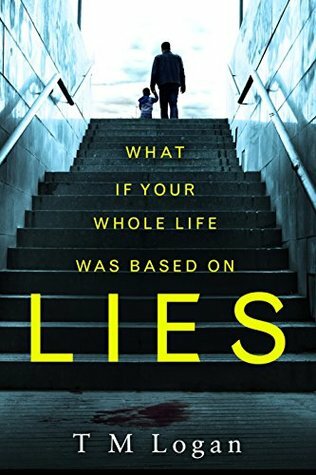 When Ben disappears and his wife Beth asks for help, there are more lies. Once that door of mistrust is opened, it starts an avalanche of lies upon lies until Joe and the reader have no idea of what is really the truth and which character is telling the truth. It isn't until the explosive last chapters that all is revealed. By then, poor Joe has been accused of Ben's murder and is ready to be arrested. He wants to believe his wife and tries to prove her right but as the lies keep piling up, that trust has been broken and he begins to doubt everything she tells him or has ever told him. I really liked the character of Joe. He was a likable character and good guy who was put in an impossible situation and he still tries to make the best of it and save the people that he loves. As he tries to find Ben on his own, he only gets himself into more trouble with the police. He loves his family and their happiness is his main goal throughout the book even after it appears that everyone is betraying him. This is a real page-turner with a surprise ending that I didn't see coming but was a perfect ending. A blogging friend gifted me a copy of her ARC of this one; I cannot wait to dive in!! Great review!